Bill (he preferred KSMU not use his last name) and his dog, Bella, are never far apart. The Cavalier King Charles Spaniel is a companion and a service dog for the military veteran who served during the Vietnam War. As he sat inside a local restaurant with country music playing over the speakers, the Springfield resident talked about Bella. "Bella is just a great dog," he said. "I mean, she does what she's supposed to do, but she doesn't know she's doing it, and she's a good family--she loves my granddaughter. She's really good with kids. She's great with our other--we have a cat, and she's just a great dog." Bill was drafted into the Army when he was 18-years-old and served as a ranger during the Vietnam War. "You're an 18-year-old kid that's got all his dreams, and this is in the mid 60's, and you've got all your dreams and hopes, and you're a kid and then, you know, you're in a war doing things that, you know, you--indescrible things...and it impacts your life. I mean, to this day my life's impacted. There's not a day goes by that you don't dream or think about it. It's a wound," he said. He was injured during his first tour, and, after he returned, he was injured again. He receives counseling to deal with what he experienced during that time. He credits his dog for helping him do things he couldn’t do before—like talking to a reporter. And she’s there for him when he goes out in public spaces. "Most veterans, you know, especially combat veterans, we don't like to be crowded or people approach us from behind, well, she'll go behind me. If I'm looking at something on a shelf or my wife and I are looking at something on a shelf she'll go behind me and just sit there. I mean, not--what's she going to do, you know, she's not an attack dog, but she puts a space," he said. Bill got his dog for free through a nonprofit organization based in Buffalo, Missouri—Woof for Vets—which provides purebred dogs at no cost to veterans. He found out about the program when he saw a pamphlet at his counselor’s office at the VA in Branson. While he was skeptical that there were no costs associated with the program, his wife encouraged him to apply, so he did. They specifically asked for a Cavalier King Charles Spaniel, at least six to eight-months-old that was socialized and good with other dogs. "We filled out six inches, you know, of requests, and Sue (with Woof for Vets) said, 'it'll take awhile,' and I thought, 'yeah, right. I'm never going to hear from these people again. It was a week or two later I get a call (and she says) 'I think we have one, I'll call you when I get it,'" he said. Several days later, he met the founders of Woof for Vets, including Sue Swanigan, in north Springfield where they’d just arrived from picking up a Cavalier King Charles Spaniel for Bill in Oklahoma. Still skeptical, he brought his checkbook. But he didn’t need it. "And then they left and we're holding the dog and just amazed, you know, just amazed. So, I tell everybody I can that it's legit. It's for real," he said. Swanigan, the vice-president of Woof for Vets, travels all over the country to pick up dogs from breeders who donate them and to spread the word about her non-profit organization. Last year, she put 50,000 miles on her car. She does what she does, she said, because of how much the dogs help veterans. 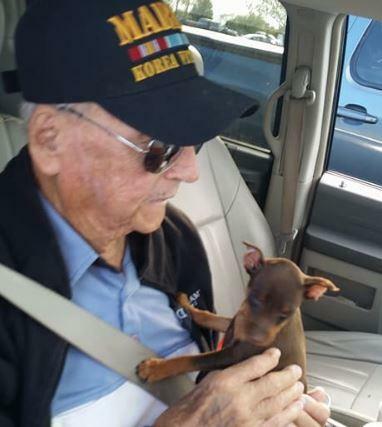 She told the story of a veteran who was more than 90-years-old, suffering from dementia who wasn’t talking when they took him a miniature pinscher puppy that his wife had requested for him. "When we give him the dog, he started talking to the dog," she said. "He'd already had the dog named, and all of us was in tears. They was eight or nine of us there, and his wife told Beverly (president of Woof for Vets), 'you've give me my husband back.'" Bill’s friend, a fellow Vietnam War veteran, also received a dog through Woof for Vets. He describes his friend as a normal Vietnam vet who’s grumpy all the time and mad at the world. He’s the nicest guy, he said, but “you never see it.” However, he’s a different person around his dog. "He melts for that dog," he said. "You know, he goochy-goos, and he's like a whole other person. We give him a hard time about it, but he loves that dog." Bill’s dog, Bella, helps other vets, too. She goes with him to the VA Clinic in Branson when he visits his doctor and counselor. And he said she senses when people are stressed. That’s a lot of people, according to Bill, who are at the VA for help dealing with PTSD. "If she sees somebody in a really bad way, especially if we're in the counselor line, she'll see somebody that's really having a tough time, Bella will go over and, you know, they'll be petting her, and they don't even know what she's doing, but she does," he said. Woof for Vets has placed dogs with veterans in eight states so far. Last year they gave 37 dogs to veterans, and the goal this year is 100. Swanigan always cries when a veteran meets their dog for the first time. Those are the moments that make all the hard work worthwhile. "Maybe I'm a little selfish, but when I see that veteran get the dog and how much it can do for him, and I love dogs, and that just sort of puts the icing on the cake," she said. She encourages the veterans and breeders to stay in touch, and they often do. That helps veterans who are alone and don’t have anyone who checks on them, she said. Pam Dean of Ozark volunteers her time every Saturday to train the dogs. She takes veterans and their furry companions to various public places so they get used to a variety of situations. "It's just been so awesome and working with Woof for Vets and helping them," she said. Woof for Vets isn’t the only local organization placing dogs with veterans. 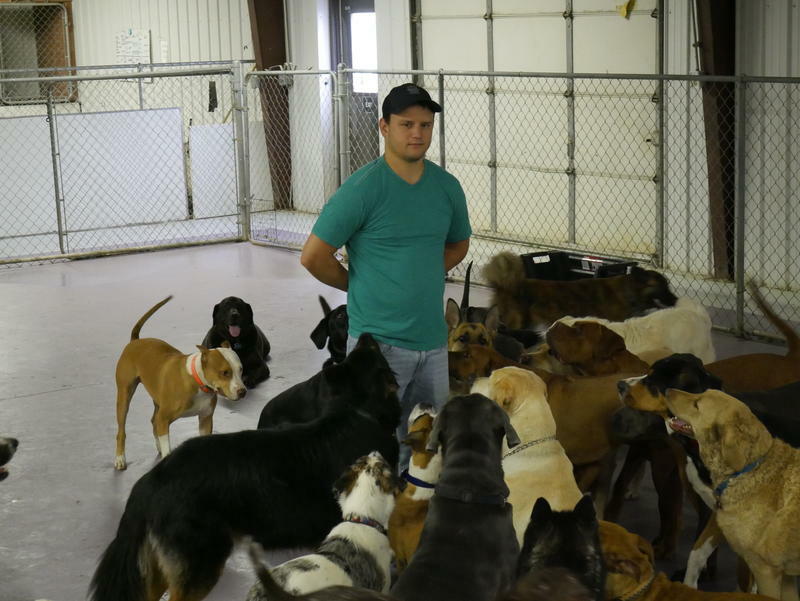 John Lopez runs K9s for Camos at the Howliday Inn Pet Resort east of Springfield. We talked about the nonprofit organization he started in a room where some of the dog training for the program takes place. 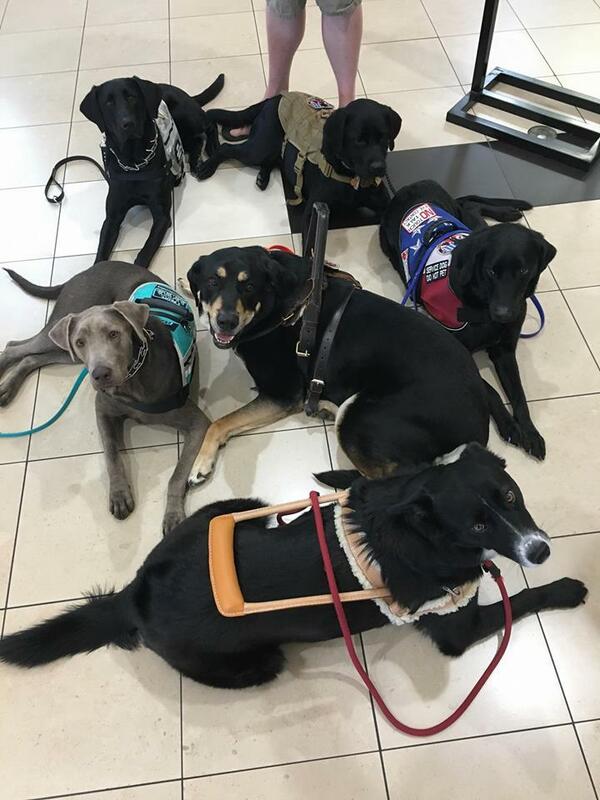 "Our mission is to help veterans mitigate the effects of PTSD, and we want to be able to give them very well trained service dogs at no cost to them," he said. Lopez uses dogs from area no-kill shelters that have been identified as having the correct temperament to be service dogs. The bulk of their training is done by inmates at the Fordland Correctional Center who learned how to work with the animals from Lopez and his trainers. Lopez is a veteran himself. He enlisted in the military in 2005 and got out in 2009. He served in Afghanistan with the Army’s 37th engineer battalion as a combat engineer. Lopez said he’s seen how PTSD and depression can affect people. While on watch one night in Afghanistan, a fellow soldier committed suicide inside the camp. Statistics show there’s an average of 22 suicides by military veterans each day. Lopez believes therapy dogs can help bring that number down. "They (dogs) help in a lot of ways. One, it gives veterans a new mission, and it gives them something they have to do. They have to take the dog out and walk them, they have to feed him, they have to--I've had one veteran who lost his arm who just became a hermit, and, just the fact that the dog will bring him his leash and then go out in public, and he has to at least get our to his yard and walk him," he said. One veteran, he said, doesn’t use a cane anymore—he uses his dog, who also helps him get up from his chair. Another dog sought help for his veteran owner who had passed out after a spike in his blood sugar, and another dog goes under her owner’s head when the female veteran has a seizure—then alerts her husband. Since last July, K9s for Camo has placed 19 dogs with veterans. The goal is 22 a year to coincide with the average number of suicides. "There's a lot of security that I think that they give them," he said. "I think that in general dogs help people even if they're not veterans, and they lower blood pressure, and there's a lot of studies on how dogs help, but for them to be task trained to help with these things in public means that the veterans are going in public more and feeling more secure." You can find out more about K9s for Camo on their website: k9sforcamo.org or on their Facebook page at K9s for Camo. Learn more about Woof for Vets at woofforvets.org and on Facebook at Woof for Vets.